We recently held a new and exciting teleclass hosted by Dr. Adam Silevitch, DMD, Partner at Lois A. Jackson, DDS, PC and Associates. 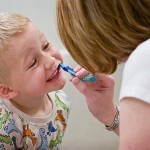 Dr. Adam answered questions regarding your childrens’ teeth, from the basics to some “hot button” topics. In case you missed it, you can listen to the recorded teleclass here. Some of the topics that Dr. Adam covered were: what to expect from my child’s first dental visit, what to do when my child has trauma to their front teeth, oral hygiene instruction for the home, foods to avoid, thumb and pacifier habits, and more. Halloween has recently passed us by, but I’m sure much of the “candy stash” still is lingering in your households. Which means our kids will have a plethora of candy of all different varieties at their fingertips. Believe it or not, some varieties of candy are better for our children’s teeth than others. Also, most of us think that moderation is the solution, but as pediatric dentists, we beg to differ. Bad Candy: Most pediatric dentists agree that gummy, chewy candies such as Gummy Bears, Sour Patch Kids, Tootsie Rolls, Laffy-Taffy, Starburst, Skittles, Swedish Fish, Jelly Bellies, and Now & Laters, (just to name a few) are the most damaging to our children’s teeth and existing fillings. This also goes for gummy vitamins, fruit leather, and dried fruit— even though these snacks are “healthy,” they can cause cavities as well. These foods get stuck in the grooves of the teeth, and for some reason, our kids do not notice it. Can you believe it? When we get food stuck in our teeth, it drives us NUTS! Our theory is that children like the “never ending enjoyment of the flavor,” or as we like to say, “the gift that keeps on giving.” These foods remain on the teeth for a longer period of time, thereby creating the perfect environment for the germs to flourish and cavities to form. In addition, these sticky foods can dislodge protective sealants and existing fillings. Good Treats: Chocolate, cookies, cake, ice cream and several other sweet treats are better for our children’s teeth, when compared to the candies mentioned above. Chocolate, cookies, cake and ice cream don’t take forever to chew and they do not get lodged into the grooves of the teeth. Chocolate, by itself, has been shown to have a protective effect. This has been attributed to the presence of protective factors: calcium, phosphate, and the milk protein – casein. There’s a protective factor in cocoa itself, which is unlikely to override the negative effect of the high sugar content of chocolate on our teeth. That is why chocolate should only be a treat. Xylitol is a sweetener derived from plants. It helps to create a more unfavorable environment for the proliferation of germs in the mouth, thereby inhibiting the formation of cavities. With children and treats, we always hear the phrase, “anything in moderation.” Well, yes, moderation is always good, but if they do eat sweets (especially during Halloween), have your children eat them all at once. Avoid ‘grazing’ over extended periods. For example, have a chocolate bar in one sitting, rather than constantly dipping into a bag of sweets over a period of hours or even days. Don’t forget to keep those teeth clean, especially during Halloween and the Holiday Season! Dr. Adam Silevitch earned his dental degree from the Boston University School of Dental Medicine before completing specialized post-graduate training in pediatric dentistry from Columbia University where he served as chief resident. He is an Attending Pediatric Dentist at New York Presbyterian Hospital-Columbia, as well as an Assistant Clinical Professor at Columbia University School of Dental Medicine. Dr. Silevitch is the Chair of the Children’s Dental Health Committee of the New York County Dental Society. Additionally, he is the Vice President of the New York Academy of Pediatric Dentistry and the Secretary/Treasurer of the Northeastern Society of Pediatric Dentistry. He has offices at 505 LaGuardia Place (Greenwhich Village) and 16 Court Street (Brooklyn Heights). More information about Dr. Adam and his pediatric dental practice can be found at www.drloisjackson.com or by calling (212) 995-8888.